Spring break is over for me and the family and while I had fun, I'm glad to be back to the routine. Also back this week, is the Diva's challenge. Laura's youngest son was in the hospital last week but I am so very glad that they are now home. I'm so happy that Artoo is doing better. A speedy recovery for Artoo and some rest for Laura are my wishes for this week. 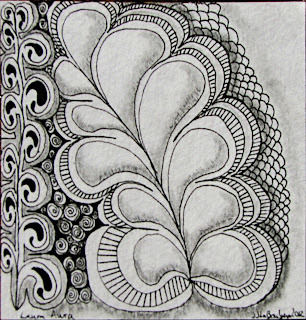 Auras in Zentangle are a repeated outline around a pattern. While these are often used to great effect and can fill a space nicely, I don't really use them unless a pattern has an aura in the design. At first I thought about taking a pattern that doesn't usually have an aura and adding one on to it. But then I thought that I'd use Opus and Flux, two patterns that often have auras but are patterns that I don't normally use. I think that my Opus is awkward but Flux turned out pretty well. I'm proudest of my shading on Flux. It turned out pretty well if I do say so myself. I had started this tile with a pretty tight string but as I added Flux, the whole string went out the window. I'm finding myself ignoring my string lately. Often I use the string as a defining point of the tile. Like a coloring book, I usually stick to the lines and don't really stray beyond them. I have been working on relaxing that a bit and fear that I am starting to swing the other way. I hope that you all have a great week! I wanted to say how very much I enjoyed seeing your interpretations of Huggy Bear a few weeks ago. They were all so incredible! The challenge really showed me how much creativity you all have and also how rigid I can sometimes be in my own vision. Thanks for such a fabulous experience everyone! The auras enhance your tile! Great idea to use flux and opus. They lend themselves well to the challenge! Your tile looks so alive - like it's pulsing. Nice. Nice! Opus and flux are perfect for this challenge. This is a lovely tile, it looks really good. Excellent use of aura! Just lovely. I am not familiar with Opus, so it is always fun to see something new. I enjoyed your post. I rarely make a string. I usually have something in the middle for structure, then have spokes out around it. So I definitely want to try some of the more free-flowing designs I see on your site and others. 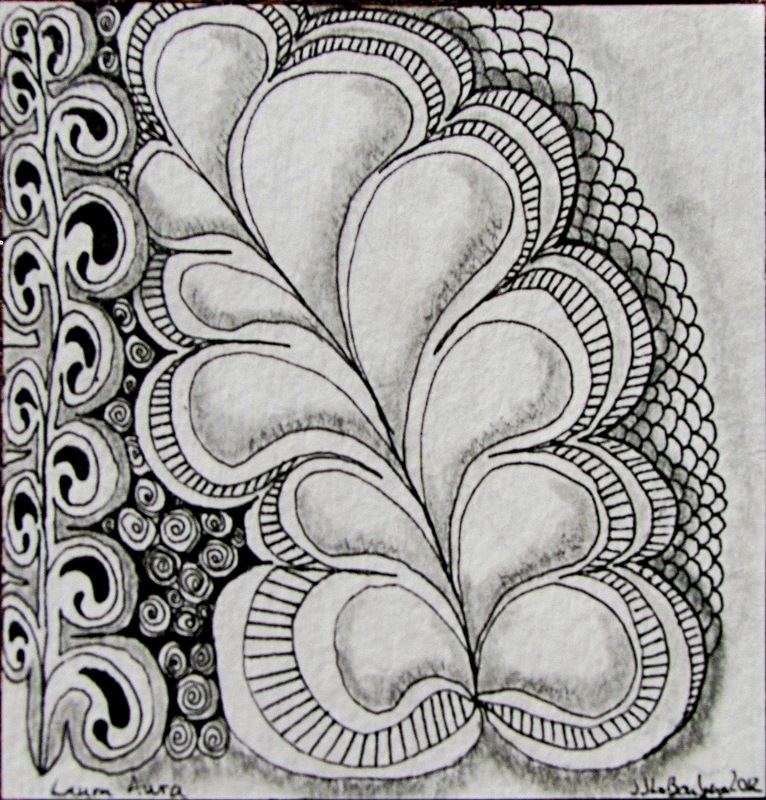 Love your zentangle! The shading is really great! I'm glad we have a new challenge and that Artoo is getting better. I'd better get to work on mine! Very nice. Love the shading. JJ, I think you did a great job on shading flux as well. I like how you added hash marks into your aura on Flux. It gives it a lot of dimension.